April 2018 – GIC news. The Neocons’ Real Plan For Syria Emerges From The Lack Of Rubble. I told you over the weekend that Trump’s presidency was over. As a practical matter it is. His yielding to his ‘advisors’ on every foreign policy issue makes it clear that he can’t or won’t stand up to the relentless pressure to do what his instincts tell him. This morning’s article at the Deep State Washington Post paints a very clear picture of what the situation is. The advisors whose loyalties are dubious run the show. Their thinking has not evolved one whit from previous administrations. Case in point they manipulated Trump into over-reacting to the Skripal poisoning by ousting 60 Russian diplomats, even though Trump clearly wanted to match Germany and France. The United States, they explained, would be ousting roughly the same number of Russians as its European allies — part of a coordinated move to punish Moscow for the poisoning of a former Russian spy and his daughter on British soil. You can almost see the evil glee on the part of the WaPo writer and Trump’s staffers who misled him into signing an order they knew he disagreed with. And this is why Trump is not president currently. This is not the first time he’s been backed into a bad decision by the nest of vipers in his administration. And he won’t be until he removes the worst people from his cabinet. Unfortunately, the trend on that front is definitely not our friend. Tillerson out. Pompeo promoted. McMaster out (who was awful), John Bolton in (who is worse). So, now that the WaPo is writing victory lap articles for the the Deep State in neutering Trump, let’s talk about where this is headed in regards to this weekend’s attack on Syria. I’ll get right to the point. This attack was all about the long-game of taking down Iran. Israel is desperate to prevent Iran from remaining in Syria after the war is over. And with good reason. That’s the prime motivation for their actions. But, on top of that is the need or the desire to always go farther, to take more than they should and use U.S. assets to achieve those goals which are in no one’s best interests, including Israel’s. Because despite the rhetoric spewing forth from Lil’ Miss AIPAC, Nikki Haley, a failed state in Syria is not good for Israel. A beaten and cowed Russia is not good for the world. And yet, that is exactly the policy that wing of the Trump administration is pushing him to pursue. Now, if they can’t get that because Gen. James Mattis isn’t a moron, then the next best thing is to prolong the war in Syria for as long as possible. Why? To bleed Iran white. To fight a war it can’t afford and keep its best military units and commanders bound down in Syria and not have them return home to help maintain order. Events in April are happening quickly. First, Iran bans the use of dollars internally. And, predictably, the Iranian Riyal blows up versus the dollar. Second, the U.S. pushes for much stricter sanctions on both Russia and Iran. Iranians can’t get dollars and are, again, being cut off from international trade as sanctions create even more uncertainty on the ground there. At the same time, President Rouhani’s economic reforms are, at best, slow to improve things. This was the source of the protests that rocked the nation in December, which U.S. and Saudi NGOs tried to fan into a revolution. Russia is finding it harder to move money around internationally and the U.S. is putting massive pressure on Europe not to do business with Iran. However, the Italians blocked even stricter sanctions on Iran, so the revolt in Europe is gaining strength. And that’s going to become a bigger part of this narrative as 2018 barrels ahead. The goal, of course, is to foment an overthrow of the current Iranian government through external pressure. And Iran’s support of Syria is a pressure point in that campaign now. The U.S. claims this strike was to end Assad’s future use of chemical weapons, which the Russians say they have irrefutable proof didn’t even occur this time. That’s the story being sold to what’s left of Trump’s base, the MAGA-drones who can’t accept that he’s not actually running the country despite his public persona to the contrary. By prolonging the war you bleed out an already bleeding Iranian economy and treasury. This is why, I think, the U.S. is hell-bent on staying in Syria even though Assad has, for all intents and purposes, won. The strikes from this weekend were intended to do much more damage than they did. The U.S. Military’s presser on Friday after the attack was purposeful disinformation. They only admitted to attacking three sites, all of which were empty and obliterated. But what about the airstrikes on no less than four Syrian airfields, including Al-Shairat (again)? Now, certainly salt this report to taste but there is a major kernel of truth uncovered by it. The U.S. intended to knock out a major portion of the Syrian Air Force with this strike and failed spectacularly. Assad’s air force has been one of the most effective parts of the war against the insurgents in Syria. They are doing what the U.S. leadership says is their goal in Syria, to end the threat of ISIS. So, it makes less than zero sense for them to then attack Syrian air fields to show Assad it will not accept his using chemical weapons in doing so. Something doesn’t add up. And, of course, we’ve known this from the beginning, but now the Russians and Syrians are providing proof of these inconsistencies if only the American people will engage with them. If the U.S. didn’t do this to just knock out Syria’s CW capability then it must have had a much, much larger goal. And that goal is Iran. The hope is that Syria will go on long enough and cost the Iranians enough that it will destabilize the country and force an overthrow of the Mullahs. There comes a point where guns meet butter. This strategy is consistent with the thinking of the Neocon/Deep State trolls in charge at the White House. It makes sense strategically to a guy like Mattis who knows Syria cannot become a truly failed state lest the entire region go off the rails, but at the same time wants a much different Iran. At that point the real chaos is unleashed. Never forget that the Russians can withstand lower oil prices better than any producer. China is the marginal buyer of Saudi oil and the Saudis are becoming less important to them by the day. Trump was forced to voice in his speech on Friday an overt plea to Putin to give up his alliance with China and Iran, abandon Syria and some of his transgressions will be forgiven. Trump didn’t believe those words anymore than I did, but watching him confirmed for me that he knows there will not be peace any time soon. That he’s not up to the task of resisting the pressure. Just as I said this weekend to the dismay of many, including myself. What it revealed was that no matter who wins, the world loses. Author JollyBPosted on 18/04/2018 Categories Worldwide News. Douma Chemical Attack Was Staged: This Short Video Proves it. The US, UK and French governments claimed that an ‘chemical weapon’ attack occurred in Douma on April 7th. They cited “social media” as their evidence for the attack, in particular a video of a chaotic scene inside a hospital where people were being treated. Yet rather than waiting for OPCW inspectors to visit the scene of the alleged attack to determine what occurred, the US, UK and French militaries attempted to bomb 10 targets, mostly Syrian military bases, on the morning of April 13th. In the short video presentation below, several doctors and other medical personnel who were in the hospital room in the aftermath of what they said was shelling – and who appeared in the video used by the US, UK and French governments as evidence that a chemical weapon was used – tell their story. Top UN Inspector: Assad Not Responsible For Chemical Weapons Attack. A former director of UN weapons inspectors has said that the Syrian government is not responsible for the recent chemical weapons attack, and claims the attack is an attempt to topple Bashar Al-Assad. 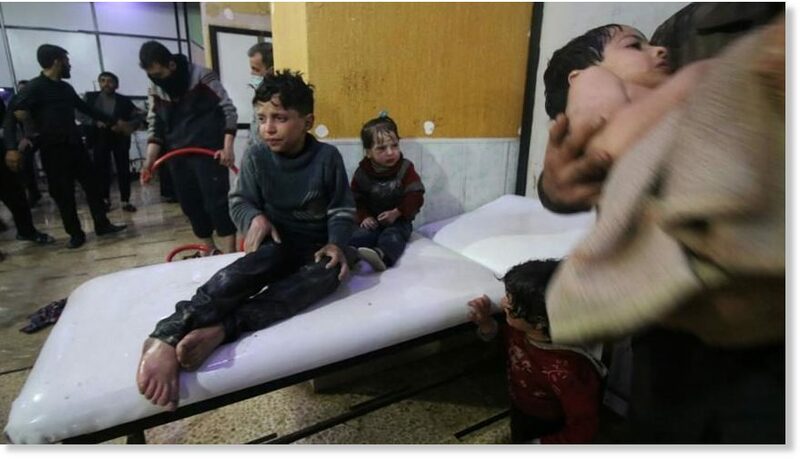 Dozens of people were killed in the rebel-held town of Douma on Saturday, in an attack President Putin and others described as a ‘false flag’ perpetrated by the Al-Qaeda affiliated White Helmets group. On Sunday night, two Israeli F-15 fighters targeted a Syrian military airbase in the Homs province, firing eight guided missiles at the airport, killing 14 soldiers. Infowars.com reports: However, according to chemical weapons expert Åke Sellström, who investigated the use of chemical weapons in both Iraq and Syria, it is unlikely that Bashar Al-Assad and the Syrian Army were responsible for the attack in Eastern Ghouta. “With great criticism from the international community, Assad and Russians bombard Ghouta bit by bit, and that they would add the opportunity to be criticized for using chemicals – it feels strange. They do not need it, their tactics are already successful,” said Sellström, adding that there could be numerous “other explanations” for the attack. Sellström added that if the United Nations was to investigate the attack, recordings and testimony would not be enough to ascertain what happened. “We would have to meet people and doctors themselves and, in particular, need samples from the environment and poisoned persons,” said Sellström, adding that it would be difficult to measure chlorine exposure “because it evaporates quickly and does not leave any clear markers in the body”. As we document in the video below, the rebel group in Douma had already agreed to leave the area within 48 hours and the battle was won. A rebel-held chemical weapons factory was also discovered in the same region where the attack happened just weeks ago. Given that the Syrian Army was on the verge of victory, it makes no sense whatsoever that they would sabotage their own success. Author JollyBPosted on 14/04/2018 Categories Worldwide News. From Skripal To Syria: The Empire’s “New Realities” Are Reaching The End Of The Road. Behold, the “logic” of the interventionists! Number one: We – that is the Globalist Deep State, centred in Washington DC – are sovereign over the entire globe and we will do as we please. Number two: That we don’t follow reality, we create it. Number three: That we are prepared to do things that will make your jaws drop, your hair stand on end, and your eyes boggle as you wonder what is going on, and while your jaws, your hair and your eyes are busy doing their thing, we will have moved onto create our next reality. In other words – we are God – and not a kind and merciful God, but a God who lords it over all peoples’, nations and tongues, who tells lies, and then tells more lies to cover up those lies and – when you poor saps are trying to work out what it is we’re really up to – before you know what has happened, those lies and those lies to cover up lies will have become the new reality. We’ll have moved on and the world with it, and the narrative we have created will have been written in the history books, which we ourselves shall write. The cases of Sergei Skripal and the alleged chemical attack in Eastern Ghouta seem somehow to represent the zenith of this ideology. I do not know who poisoned Sergei Skripal or for what reason. It could be that the Russian Government was behind it, although this would mean accepting the highly improbable thesis that they decided to target a has-been MI6 spy, who they released from prison eight years ago, using perhaps the dumbest assassination method in the history of the world – an ineffective, slow-operating, “military-grade” nerve agent, which could be traced back to them, and which they smeared on a door handle in rainy Salisbury –, a week or so before a Presidential election, and less than 100 days before they are due to host the World Cup. In other words, the official narrative does not rest on accepting that the Russian state is the epitome of pure evil; it rests on accepting that it is the epitome of insanity and bumbling incompetence. I do not know what happened in Eastern Ghouta. It could be that the Syrian Government was behind what is alleged to have happened (if it indeed did happen), but this would mean having to accept the thesis that just 24 hours away from completely liberating the last pocket of resistance in Damascus, after the US, the UK and France had all warned that they would attack if chemical weapons were used, just a week or so after the US President, Donald J. Swamp, announced that the US would be pulling out of Syria (which they occupied illegally, by the way), they made the decision to use a weapon that gave them no military advantage whatsoever, but which was practically guaranteed to be used as a pretext for airstrikes against them. In other words, like the Skripal case, the theory does not stand on accepting that the Syrian state is the epitome of pure evil; it stands on accepting that it is the epitome of self-defeating stupidity on an epic scale. But you see what I’ve done? I’ve fallen right into Karl Rove’s trap, haven’t I? I’m asking questions about whether the narratives in these cases stack up. In the Skripal case, I’ve been judiciously studying reality by asking lots of questions that ought to have occurred to anyone with a keen interest in arriving at the truth (here and here, for instance). I could do the same with the Syrian case, if I had the time. Yet while I’m doing so, the narrative is moving on. I’m falling into exactly the trap that Karl and his disciples have laid. They want two sorts of people: those who just blindly accept that it was the Russians wot did it, or that it was Assad wot did it; and those who spend their time asking questions about the official explanations. The first group call the second group conspiracy theorists and nutters. The second group call the first group dumb sheeple. And the Globalist Deep State laughs and laughs and laughs as the two groups battle it out to make sense of what has happened, leaving it free to march on to create the next reality. Truly I tell you, these Bolsheviks have learnt their Hegelian Dialectics well. Now, this is not to rule out that in the Salisbury and Eastern Ghouta cases the official narratives might – just might – be the correct ones. That both Vladimir Putin and Bashar Assad might be the Laurel and Hardy of Geopolitics. Yet it has to be said that whatever else you think about them, neither of them tends to come across in interviews as being what you might call dumb or inept. Nor do either of them give the impression that they have sudden insane impulses to do things which have absolutely no benefit to them, but which hand their enemies massive PR victories. But this is besides the point. The point is not whether these particular incidents are what the official narrative says they are, or whether they are provocations. It suffices for the “new reality creators” to create their realities on occasion, or perhaps to distort occurrences which they didn’t create, and before you know it you have your two groups battling over events which may be real or fake: the conspiracists – who are studying every event to try to work out the details and the inconsistencies – and the sheeple – who believe that their Government is full of good hearted, white hatted chaps and lasses who would never, ever do anything bad – unlike those orcs over in Mordor. Rove and Co have basically created a “reality” where truth is no longer discernible, where assertions of guilt are taken as fact, and where holes in these kinds of incidents only serve to divide the people further, so that the Globalist Deep State can move on to create their next reality. But let’s not get gloomy. The good news is that although they clearly think they can get away with it indefinitely, they can’t. No kingdom or empire built on a mountain of lies can stand indefinitely. They all fall. And can’t you start to sense the signs that the empire’s “new realities” – or what are known as lies in laymen’s terms – are reaching boiling point? Don’t you sense that they have just got too confident and in doing so have begun to get careless? They are making mistakes. And as they do, they are having to resort to bigger and bigger lies to cover up the ones they’ve already told. Sadly for Rove and Co, but happily for the rest of us, the world doesn’t actually work the way they think it does. Reality – I mean real reality, rather than the phoney reality they have created – will catch up sooner or later. I sense that it’s on its way even now. And when it finally comes, the whole rotten edifice that these “history’s actors” have tried to create will crash and burn. Bringing much rejoicing. A Map Of The Syrian War: Who Is Who (And Where). On Thursday, just 24 hours before Trump ordered airstrikes on Syria for the second time in just over a year, we said that “with war likely set to break out in Syria at any moment, a question many Americans are asking is… where is Syria? Fast forward to Friday night, when at exactly 9pm ET on Friday 13, Trump announce that war airstrikes on Syria have once broken out, as expected, and for those who may have missed the various tactical and strategic maps of the Syrian theater, here they are again. The first and most useful one, courtesy of Turkey’s Omran Dirasat think tank, shows updated areas of control and influence in Syria by international military forces with reference to the most prominent international military sites in Syria. The second map, from Dirasat employee Nawar Sh. Oliver lays out the control and influence zone in Syria as of April 2018, revealing the relative % of gains and losses in the last 24 days. Finally, from the regional political journal, Suriye Gündemi English, here is a map showing the latest military situation as well as location of key military bases in Syria ahead of the expected US strikes.